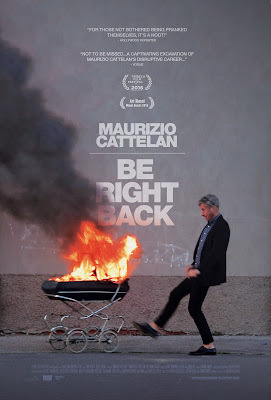 This portrait of the artist Maurizio Cattelan was one of my favorite films at Tribeca last year and one of the best films I saw in 2016. A glorious look at the man and his work that kind of turns the tables on the audience even though we should know better. Cattelan is a jokester in the art world of sorts. His reputation was made by doing crazy things like hanging a sign on an empty locked gallery saying "Be Right Back" and then never appearing. Another time he stole another artist's show, boxed it up and showed it in a gallery. Eventually he moved on to sculptures and other works of art. He even hung everyone of his works from the ceiling of the Guggenheim museum in New York. His story is an amazing one and its told largely by someone that pretends to be Cattelan. He does so for Cattelan because doesn't like to talk about his work. He's so good at it that as you watch the film you forget that he's not the real deal. I mean he doesn't look like the man in the documentary and archival footage, but we buy it, even after it's pointed out to us. I knew this was a great film since I went from thinking Cattelan was a hack to being amazed at what he was doing. I fell in love with his art and the ideas behind it. The film convinced me of the man's greatness to the point I'm no convinced I never had any doubt. I love this film. One of the best films I saw in 2016 and an absolute must see.